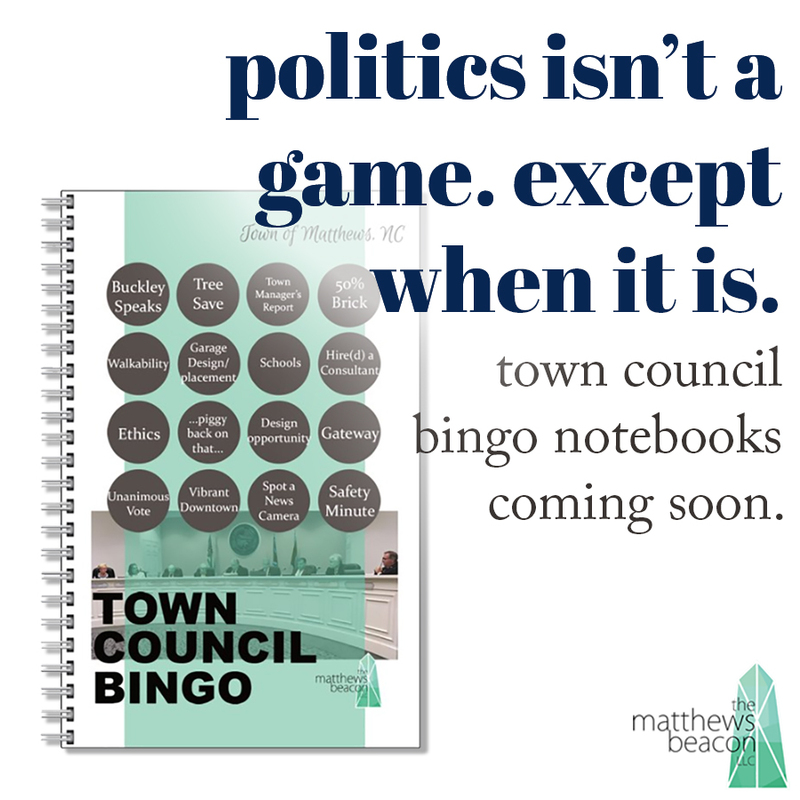 News About Town: Tonight's BOC meeting looks to be a short one, so if you're looking to dip your toe into the local government waters it's a good one to start with. The Board will approve some appointments, discuss new public art, and review the Board's policy for deferring agenda items. News Around Town: Matthews PD announced two arrests last week for a robbery that occurred at the Lowe's in Sycamore Commons on April 2nd. MPD thanked the public for assistance in identifying the suspects. The arrests were made by Mint Hill PD, who had their own list of charges against the suspects. One Fun Thing: Thank you to everyone who participated in our inaugaral Beacster Egg Hunt! We hope you enjoyed exploring the site! Our grand prize winner with 16 eggs is reader Pamela Mitchum! Coming in second with 12 eggs is Kristen Fuller, and third with 8 eggs is Kelly Leavy. All participants will receive a bit of Beacon goodness, check your email for information on claiming your prize! News About Town: Prior to last night's BOC meeting, the Board had a special meeting in the Jordan room to hear the results of a workload analysis for the Matthews Police Department. The Center for Public Safety Management performed the analysis. CPSM's report details 74 recommendations to improve the safety and efficiency of MPD. The full report is available here. News Around Town: Thursday, April 11, CMS is holding a Community Engagement Session at Crown Point Elementary. The event begins at 6:30 p.m., and is an opportunity for parents, CMS employees, and community members to engage in discussion with CMS representatives about the CMS budget for the 2019-2020 school year. One Good Thing: This Saturday Dynamic Water will host a charity golf tournament at The Divide golf club in Matthews. Dynamic Water is a nonprofit organization based in Raleigh with a mission to provide clean, safe drinking water to communities in need. To register for the event and learn more about Dynamic, click here. News About Town: Tonight the Town Council meets, first in the Jordan Room at 5:30 to review workload analysis for the Police Department, then in the Hood Room of Town Hall for a Board of Commissioners meeting (7 p.m.). Tomorrow (Tuesday, April 9) the Environmental Advisory Committee meets at 7:00 p.m. at the Public Works Facility (1600 Tank Town Road). Wednesday the Parks, Rec, and Cultural Resources Advisory Committee will meet at 6:30 p.m. at the Community Center. One Good Thing: Interested in learning American Sign Language or brushing up on existing skills? Head on over to the Matthews library from 3-4 p.m. on Tuesday, April 9th and join professional ASL interpreter Rebecca Wilson for the ASL Conversation Group. The group is an informal gathering for signers of all levels to learn the basics and practice their skills. News About Town: It is once again time to Meet with the Mayor! Mayor Paul Bailey will be at Miki’s Restaurant (1819 Matthews Township Pkwy) tomorrow (Saturday, April 6, 8 a.m. until 9 a.m.) and he’s ready to answer your questions and chat about what’s going on in Matthews. Get there early and have breakfast or drop in to listen. Catch up on the news over a hot cup of Beacon. One Good Thing: This Saturday, from 9 a.m.until 1 p.m., Butler High School (1810 Matthews Mint Hill Road) will be transformed into Hillman College (for those who have forgotten Dwayne Wayne and flip-up glasses, the college from the sitcom “A Different World.”) In its third year, The Hillman Experience is an opportunity for students to learn about Historically Black Colleges and Universities (HBCUs). There will be a pep rally that includes step and a marching band, a panel discussion about the HBCU Experience, and a college fair. News About Town: The agenda is online for the Monday (April 8) Town Council Meeting. There are dogs on the agenda! At the beginning of the agenda is an introduction of retired Police K9 Castor, and later, under the Consent Agenda, the Town Council may approve the retirement of Police K9 Willow and sale to his/her handler. Also, the Entertainment District Small Area Plan Overlay is once again on the agenda. The Virginia Frazier Celebration Tree on Sadie Drive is blooming. News Around Town: Niche.com, a website dedicated to giving insight on places to live, recently unveiled their ratings of suburbs around Charlotte. Matthews received #5 in most desirable Charlotte suburb, #23 for most diverse suburb, and #10 in best suburb to raise a family in the Charlotte area. One Good Thing: Picked through a blind audio audition, thirteen ensembles (over 600 students) will participate in Charlotte Concerts’ A Musical Showcase Competition on Monday, April 8. From Matthews, Crestdale Middle School’s 7th Grade Band has been chosen to participate. The showcase will be held at Belk Theater in Blumenthal Performing Arts Center, Charlotte. News About Town: Matthews Police Department's own Captian Roy Sisk recently completed the Federal Bureau of Investigation National Academy (Class # 275). The course is a 10-week intensive at the FBI training facility in Quantico, Virginia. Captain Sisk started in January and finished in mid-March. Content included law, behavioral science, forensic science, understanding terrorism and terrorists’ mindsets, leadership development, communication, and wellness. Less than one percent of US law enforcement officers complete this training and Captain Sisk brought what he learned back to Matthews to share with the department. News Around Town: Windstream Holdings, Inc. and its subsidiaries have filed voluntary petitions for financial reorganization under Chapter 11 Bankruptcy Protection. Operations are expected to continue as normal, and employees will continue to receive their usual pay and benefits. Windstream is one primary internet service provider for Matthews. One Good Thing: This Sunday support local artists at the McDowell Arts Center (123 East McDowell St.). Students from Eileen Schwartz's art groups, Art for Veterans and The McDowell Group, a special group with talent, will have their work on display and some items will be for sale. News About Town: Mt. Moriah Missionary Baptist Church was the victim of property damage once again last Friday. Matthews Police Department is looking for assistance in identifying two suspects, who were caught on video cameras at the church (https://www.matthewsnc.gov/newsview.aspx?nid=6224). Anyone with information on the incident is encouraged to contact Detective Chris Duryee (cduryee@matthewsnc.gov). News Around Town: According to the NC Constitution Article IX, Section 7, “the clear proceeds of all penalties and forfeitures...for any breach of the penal laws of the State, shall belong to and remain in the several counties, and shall be...used exclusively for maintaining free public schools." In relation to recent news, the Article dedicates the fines incurred by Taft Family Ventures along Monroe Road to Charlotte Mecklenburg Schools, rather than for replanting trees cut down within the dedicated tree save area. The voluntary fee provided by the developer (in the amount of $100,000) may be used for replanting or as the Town deems appropriate. One Good Thing: Gather a little vitamin D, breathe some fresh air, then soak up the post-exercise endorphins with yoga in the park. This Friday, join Elinor Edvi-Miller at Stumptown Park for a free session of vinyasa flow and deep stretch yoga from 9:30 to 10:30 a.m. The program will continue for five more Fridays throughout April and May for the cost of $25 for the series. News About Town: The Great Easter Egg Expedition begins this Friday, April 5, and runs through Sunday, April 21. 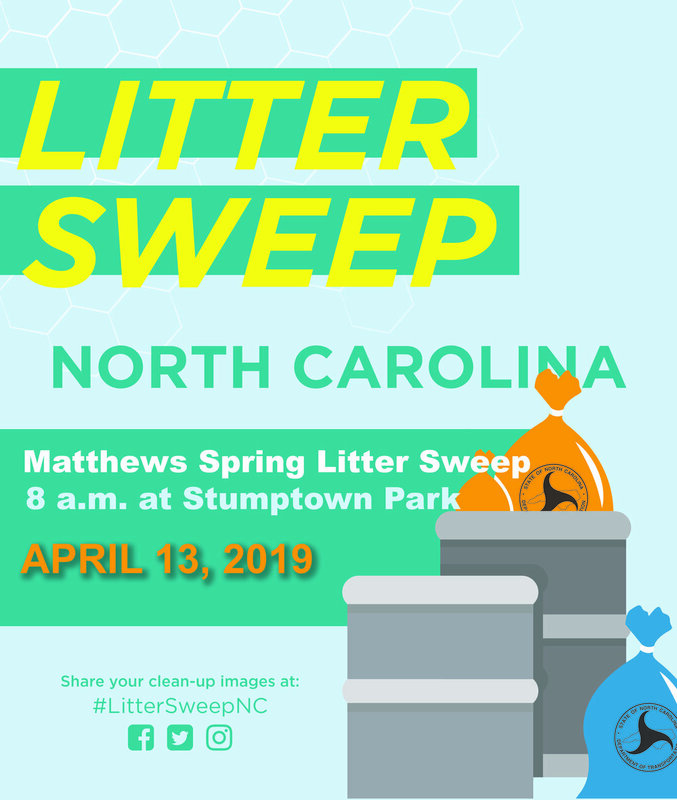 In the past the Town has hosted an egg hunt at Stumptown Park, but this year they’re going bigger and better by hiding several thousand eggs throughout town parks (Stumptown, Squirrel Lake, Windsor, and Sardis Parks) and Four-Mile Creek Greenway (between John Street and Chesney Glen). The eggs will contain toys and the chance to win bigger prizes if you find a Golden Egg. Consider it a town-wide game of Gamete-mon Go! News Around Town: Angelica Figueroa, a certified financial coach with Sharonview Credit Union, will be on hand this Wednesday at the Matthews Library to talk about planning your financial future. The class, Money Smart Week: Steps to Financial Freedom, will be from 6:30 p.m. to 7:30 p.m. in the Community Room. One Good Thing: Even though the weather has been nice, we’re not out of the woods with frost yet. There are a couple of days calling for low 30s in the evenings (like last night). If you’ve already caved and started your summer annual crops…let’s be honest, tomatoes are super tempting to plant right now…make sure you have a method to protect them from the kiss of cold.